You are here: Home / Jewelry / Bracelets / 1970s Van Cleef & Arpels gold and diamond bracelet. 1970s Van Cleef & Arpels gold and diamond bracelet. I’m trying to branch out a little bit, my lovelies. I mean, I’ll never stop showing you Art Deco strap bracelets. But I can show you other things sometimes too, right? This is a pretty serious piece (by which I mean “bold” not serious as in “not fun” – because this is a seriously fuuuun bracelet.) It’s by the fabulous Van Cleef & Arpels, which you may have surmised based on the presence of the maison’s signature clover-like Alhambra motif in the central row of the design. This close in, you can tell that the gold links are textured, which adds a layer of visual interest that would have been missing otherwise. I adore all of the negative space in this piece: it’s sort of a funky take on lace. Or macrame, perhaps, since it does date to 1973. Let’s get right up in its face. You know you want to. I bet this bracelet has a marvelous presence when worn. Even imagining the feel of it on my wrist gives me the urge to make expressive gestures. 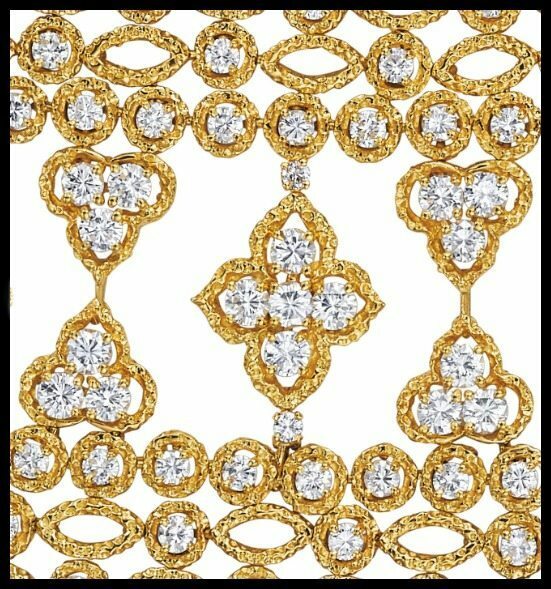 What do you think of this Van Cleef & Arpels gold and diamond bracelet? Would you wear it? This 1970’s Van Cleef & Arpels gold and diamond bracelet was listed in a recent Phillips auction. All images and info are thanks to Phillips.